I know that so many of you have been sending your prayers with us on this trip, especially for the Brazilian leg of our journey. It’s our first time in Brazil and we have arrived because a man here in Brazil, called Denny discovered the Divine Truth. He felt so inspired by the truth that he began to give free sessions about Divine Truth following his other classes on iridology and family dynamics. When we shared Denny’s story some of you in Australia were so inspired by his efforts that you donated the funds for us to travel here. So here we are in Brazil, a place where every religion in the world is practiced. It is also a land where today’s common teachings of reincarnation are so entrenched that there is a saying here in Portuguese when things are going badly ‘I must have thrown stones at the cross’. Even Christians it seems are not immune to the belief in multiple past lives. We left Barbados on Thursday and travelled 24 hours (via Miami) to arrive in the city of our first talks, ‘Belo Horizonte’, which means Beautiful Horizon. The city is in the mountains and has around 5 million inhabitants. Adriana, a professional translator from the south of Brazil, flew in to gift her translation to us for the entire weekend session. She has been following the path for two years via youtube and MP3 recordings and it was great to finally meet her. She was helped out for some of the translating on the weekend by a new and lovely friend, Isabella. About 50 people arrived to our first session on Saturday, and AJ covered two topics on the day – ‘The Truth about God’ & ‘The Truth about the Human Soul’. There was varied interest and already the topic of reincarnation was raised with some mixed responses. On Sunday I participated, channelling some of the spirits who were present with the audience and AJ spoke about ‘The Truth About Spirits & Reincarnation’. While many mixed emotions were stirred in those present, overall the air was clear and AJ was able to speak clearly and explain a great deal. I was also aware of a huge response in the spirit world. Brazilians have an exuberance about them and a huge desire to be involved with others and evidently this doesn’t change after passing. So I could feel much chatter, confusion, outrage, joy and grief at the discussion surrounding reincarnation. Yesterday we spent recording an interview between AJ and Denny with Adriana doing live translation. 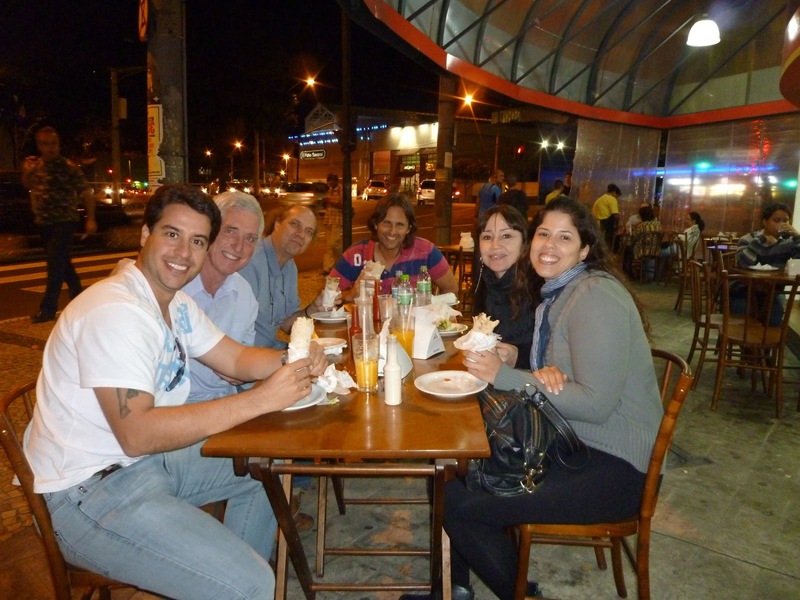 Last night we shared long discussion and delicious falafel with some new friends. We are enjoying our stay and have passed on your love to many as you sent it. This entry was posted in Travel on August 8, 2012 by Mary. Deuteronomy 18:10–1210There shall not be found with thee any one that maketh his son or his daughter to pass through the fire, one that useth divination, one that practiseth augury, or an enchanter, or a sorcerer, 11or a charmer, or a consulter with a familiar spirit, or a wizard, or a necromancer. 12For whosoever doeth these things is an abomination unto Jehovah: and because of these abominations Jehovah thy God doth drive them out from before thee.It is appointed for men to die once and after this comes judgment. (Hebrews 9:27)Revelation 1:7, NIV. "Look, He is coming with the clouds, and every eye will see Him, even those who pierced Him; and all the peoples of the earth will mourn because of Him." 1 Thessalonians 4:16-17, NIV. "For the Lord himself will come down from heaven, with a loud command, with the voice of the archangel and with the trumpet call of God, and the dead in Christ will rise first. After that, we who are still alive and are left will be caught up with them in the clouds to meet the Lord in the air. And so we will be with the Lord forever." Matthew 24:27, NIV. "For as the lightning comes from the east and flashes to the west, so will be the coming of the Son of Man. "How can a man claiming to be Yahshua ignore his own words The man you follow is a false god I have seen him with a true sight and he is ugly vile and repulsive a demon. Run and never look back for the day of judgment will fall on him and all that walk with him. How I wish I can fly to the Brazil. Try to visit Portugal, you gonna love it.